9x12, cvi + 254 pp. George Frederick Bristow (1825–98), American composer, conductor, teacher, and performer, was a pillar of the New York musical community for the second half of the nineteenth century. His participation in an important mid-century battle of words—between William Henry Fry and the journalist Richard Storrs Willis, concerning a lack of support for American composers by the Philharmonic Society—has unfortunately overshadowed his accomplishments as a composer, which were significant. Bristow is remembered today primarily for his opera Rip van Winkle (1855) and oratorio Daniel (1866), but he was also a skillful and productive composer of orchestral music, one of only a handful of American orchestral composers active at mid-century. Bristow wrote his Symphony No. 2 in D Minor (Jullien) in 1853. It is a substantial work in four movements, scored for the standard orchestra of the early nineteenth century, and strongly influenced by the personal styles of Beethoven and Mendelssohn (whose works were performed regularly by the Philharmonic Society). The symphony is skillfully crafted and melodious—an intrinsically worthy work of musical artistry. It was named to honor the French conductor Louis Jullien, who visited the United States in 1853–54 with an unparalleled orchestra. 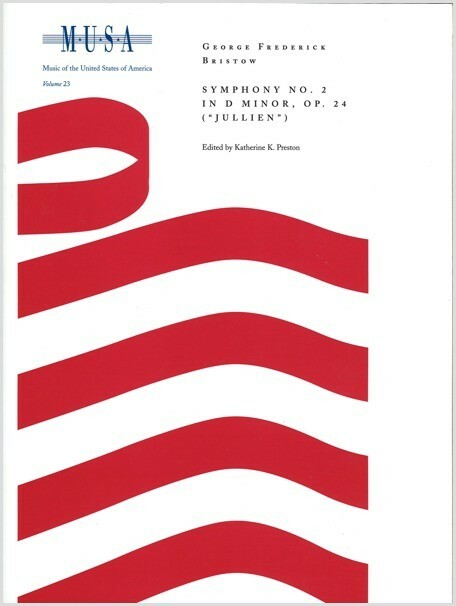 While in the United States, Jullien both commissioned and performed American works (including this symphony); his support served as the catalyst for the Fry/Willis battle. The introductory essay to this symphony examines Bristow’s career, the composition of orchestral music in America at mid-century, and Jullien’s role in the musical battle. This edition makes available for the first time an important work that has been undeservedly forgotten for over 150 years.